The third edition of the Itacoa Legends, a.k.a. the World Cup of Bodysurfing, just saw a huge gathering of rare bodysurfing talent and good vibes. The Cariocas (Rio locals) are true showmen and women, pulling off blindingly-fast spins, often before they even drop in. At one point in the opening day, Jaoa Foca pulled off six clean spinners in one wave. It was an impressive move for a wave like Itacoa, a thumping, hollow beach break that rarely permits more than a couple of point-generating maneuvers. The waves started to really turn on mid-morning for the women’s heat, which many thought was the best of the qualifiers. Briguitte Linn tapped one hot wave after another, showing perfect form and epic spins. The culminating moment occurred at the end of the day, as Renan Talarico and Lucas Nelli rode in side-by-side after their heat, right into a two-man barrel. This year’s Legends featured competitors from South Africa, the U.S., Canada, Mexico, Peru, Argentina and, of course, Brazil. The range of international and home-grown talent was impressive. On one hand, you have riders like Marcelo Zampieri, who has an extremely clean, technical style. These guys are like half-pipe riders who fine-tune their tricks to perfection. Then there are those like J.C. Rodriguez, a local standout who distinguishes himself by being completely fearless on huge drops. Itacoatiara local boy Kalani Lattanzi is an all-around waterman who spends several months charging Puerto every year and is pushing big wave limits at Nazare, Portugal. Kalani has won the annual bodyboarding world competition in Itacoa twice and is also a skilled stand-up paddler. At only 22 years old, Kalani’s well on his way to being one of the foremost big wave riders on the planet. And then there’s Mark Drewelow of San Diego, who brought a completely maverick style to his second year in Legends. One of Mark’s moves (which I dubbed “the flying squirrel”) comes when he generates great speed underwater using a tandem dolphin kick before completely breaching out of the wave. Mark’s an accomplished bodysurfer in all conditions, but he’s only added aerials to his repertoire in recent months. One of the things that Mark explained to me is that when you pop into the air, the human reflex is to pull your arms close to protect your core as you fall. Mark is now training to keep his arms outstretched in the air to yield a full-on bodysurfing Superman pose. 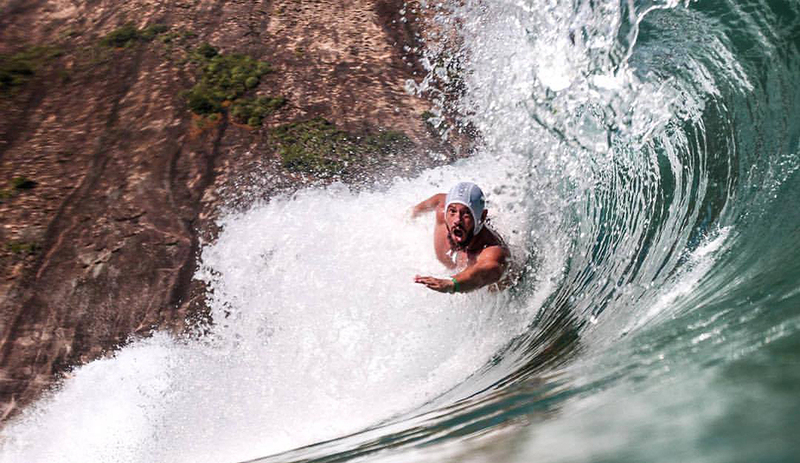 “Itacoatiara is one of the top five bodysurfing waves on the planet,” Mark says. And if anyone has been around enough to bestow “best on planet” status to Itacoa, it’s the 55-year old Drewelow. Aside from being one of Mark Drewelow’s favorites, Itacoatiara (eet-ah-koh-CHARR-ah) has to be one of the most beautiful beaches in the world. Flanked by granitic domes capped with unfurling rainforest, it’s a mile-wide mini-bay with honey-colored sand. It’s like Carmel Beach on acid. The water clarity is exceptional – light green and so clear you can easily see the sandy grooves on the bottom. It’s a remarkably pristine setting for being on the edge of a 6 million-person mega city. The water temps hovered around 68F/20C during Legends, so most contestants chose to wear some rubber. Mark and Briguitte specifically wear triathlon suits to reduce drag (“I get 20-30% more speed with my suit,” Mark estimates). Meanwhile, the air temps ranged from about 68-78 degrees. It was like Christmastime on the North Shore. Perfection. 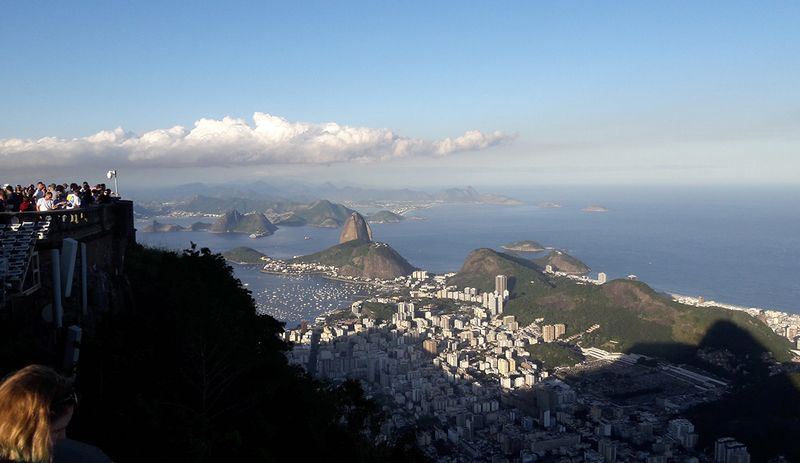 The recent instability in Brazilian politics and concomitant downturn in the economy have cause a spike in crime in the area that sees thousands of people visit the beach while only hundreds actually live there. I was told of instances where armed men on motorcycles have been robbing pedestrians on the streets of Itacoa. But watching all the kids and half-naked beachgoers converging mirthfully on Puro Suco, the juice shop that is the community anchor, it seemed hard to imagine. Itacoa is a real-life paradise found. 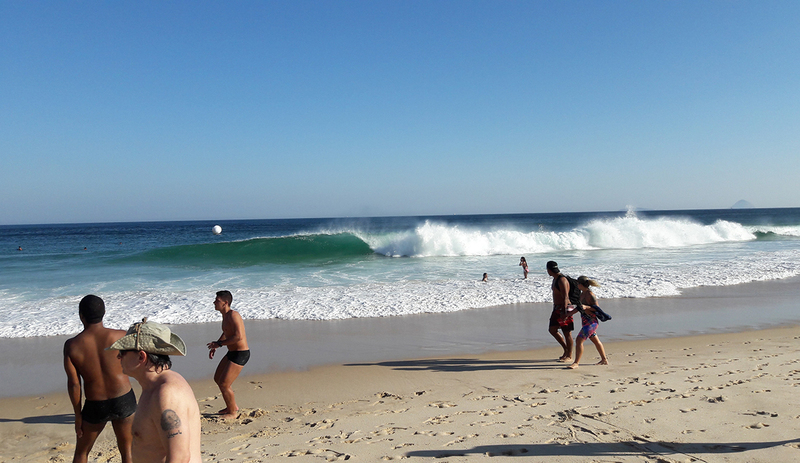 The whomping shorebreak of nearby Copacabana and Ipanema have always generated a strong crew of bodysurfers here. Then came Homem Peixe (the “Fish Man”) — a popular show dedicated to bodysurfing that helped the sport gain real legitimacy and momentum in Brazil. (The Fish Man, a.k.a. Henri Pistilli, competed in Legends 2016.) Suddenly, surf de peito was not just a casual endeavor, but a sophisticated sport for powerful watermen and women.